Recent advancements in solar, LED and industrial lighting technologies have helped develop a new type of beacon with hands-off capabilities. The traditional LED beacon is the latest device to be equipped with solar panels, greatly enhancing its power management and operational features. Without reliance on the grid, such devices can be installed in virtually any outdoor location that is exposed to sunlight on a regular basis. Read on to learn about the benefits of solar LED beacons and its applications in various industrial sectors. Solar LED beacons are cylindrical or rectangular, compact lights that are used to boost early warning systems in outdoor locations that are prone to dangers and accidents. The highlight of the device is its solar features. The beacons can operate continuously without power from a grid, using connected solar panels and a battery. During operation, the fixture’s solar panels harvests sunlight, which is converted into usable power. At this point, it may be stored in a battery for use during nighttime or cloudy conditions, or used by the LED beacon if the battery is fully charged. Because the device relies on the efficiency of the panels, one must install the units outdoors, where maximum exposure to sunlight can be achieved. 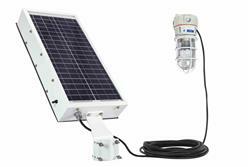 LEDs are ideal for solar beacons, because they have low energy requirements. With an average lifespan of 50,000+ hours and a solid-state design, the lights are not prone to meticulous maintenance. By comparison and from a cost perspective, beacons that incorporate high-intensity discharge (HID) technology, are up to three times more expensive to maintain due to the fragile nature of the bulbs. Moreover, HID lamps do not support toggling- a feature that is used frequently in fast-moving environments, such as high-traffic crosswalks and commercial airline spaces. To reduce risks related to malfunction or premature failure in unpredictable locations, solar powered LED beacons may support corrosion resistant designs or Ingress Protection ratings for use in industrial plants and marine environments. Solar LED beacons may be applied in hazardous locations, such as chemical manufacturing plants, grain processing facilities and oil refineries. Such luminaries serve as warning signals for treacherous areas around the building. For example, a beacon may be installed at a corner of a high traffic location, where turning a corner could expose workers to unforeseen risks. It can also be found at entrances of outdoor storage tanks, to aid workers approaching the site during nighttime operations. Furthermore, the fixtures may also be installed on long walkways, where the center of the path is poorly lit. The flashing features of the beacon could help workers stay alert on the site. To prevent the ignition of combustible substances in hazardous locations, solar beacons must hold relevant explosion proof ratings found in the National Electric Code (NEC). The volatile compounds present in and around the facility dictates the applicable Classification and Division of the solar powered beacon. Explosion proof solar LED beacons are designed to mitigate deadly combustions by containing sparks inside the unit. In the event a flammable compound reacts with a spark generated by the light, the unit’s explosion proof mechanisms will actively prevent the combustion from escaping the fixture, where it can spread or cause a chain reaction of explosions. The use of solar LED beacons may help streamline compliance with complex industrial lighting guidelines. In the commercial aviation sector, which is governed by the Federal Aviation Administration (FAA), the lights primarily function as markers and early notification pods for aircraft operators on the worksite. In anti-collision systems, beacons or strobes with a rate of 1fps (red or white) are utilized on the ground to assist pilots during takeoff and landing. The lights may also serve as warning points behind stationary, operating aircrafts, where force generated by jets or large propellers could cause harm to workers passing by the area. In addition to notifying workers around the aircrafts, solar LED beacons assist commercial air traffic controllers by serving as reference points during operations. In the construction industry, LED rotating beacons are essential components to lighting systems on radio-operated cranes. Such devices are typically installed on various levels of the crane to warn nearby workers about the presence and movement of the machine during operation. Beacons with strobing functionality are also used as markers for pilots navigating airplanes around the area. This practice is reinforced and promoted by the Occupational Safety and Health Administration (OSHA) in title 29 CFR 1910.179(i) and ASME B30.2-2005, Overhead and Gantry Cranes 2-1.15.3 Types of Devices (not applicable to under-hung cranes, overhead hoists, or monorails). The application of solar LED beacons in mainstream locations, such as busy roads, crosswalks and stop signs, can improve the safety of pedestrians and drivers. This was proven in two case studies released in 2008 during the Transportation Research Board Annual Meeting. Titled "An Analysis of the Effects of Stutter Flash LED Beacons to Increase Yielding to Pedestrians Using Multilane Crosswalks" and "The Use of Stutter Flash LED Beacons to Increase Yielding to Pedestrians at Crosswalks," the reports focused on the use of Rectangular Rapid Flash Beacons (RRFB) as early warning signal devices at crosswalks. During the trial, researchers installed solar powered RRFBs at high-traffic areas on crosswalks. A configuration of two beacons were installed (on the right side of the crossing and mounted on top of the crossing sign) per crosswalk system. The results showed that solar RRFBs improved yielding from 18 percent to an impressive 81 percent. Interestingly, when researchers installed a four-beacon system (two beacons on each side of the crossing), yielding practices further increased by 88 percent. An evaluation was conducted after one year, and scientists were able to conclude that yielding behavior remained the same; solidifying the application of solar LED beacons in the area.